Karnak is the modern-day name for the ancient site of the Temple of Amun at Thebes, Egypt. The Egyptians called the site Nesut-Towi, "Throne of the Two Lands", Ipet-Iset, "The Finest of Seats" as well as Ipt-Swt, "Selected Spot" (also given as Ipetsut, "The Most Select of Places"). The original name has to do with the ancient Egyptian belief that Thebes was the first city founded on the primordial mound which rose from the waters of chaos at the beginning of the world. At that time, the creator-god Atum (sometimes Ptah) stood on the mound to begin the work of creation. The site of the temple was thought to be this original ground and the temple was raised at this spot for that reason. Karnak is believed to have been an ancient observatory as well as a place of worship where the god Amun would interact directly with the people of earth. The Temple of Amun is the largest religious building in the world (though some claim Angkor Wat in Cambodia is larger) and honors not only Amun but other gods such as Osiris, Montu, Isis, Ptah and the Egyptian rulers who wished to be remembered for their contributions to the site. It was built gradually over the centuries, with each new ruler adding to it, from the beginning of the Middle Kingdom (2040 - 1782 BCE) through the New Kingdom (1570 - 1069 BCE) and throughout the Ptolemaic Dynasty (323 - 30 BCE). It has even been suggested that the rulers of the Old Kingdom (c. 2613 - c. 2181 BCE) first built there owing to the style of some of the ruins and the king's list of Old Kingdom monarchs inscribed by Tuthmose III (1458 - 1425 BCE) of the New Kingdom in his Festival Hall there. His choice of kings suggests that he may have removed their monuments to build his hall but still wanted them to be remembered. Structures were regularly removed, renovated, or expanded during the temple's long history. The complex continued to grow with each succeeding ruler and the ruins today cover over 200 acres of land. It has been estimated that one could fit three structures the size of Notre Dame Cathedral in the main temple alone. The Temple of Amun was in constant use with perpetual growth for over 2,000 years and considered one of the most sacred sites in Egypt. The priests of Amun who oversaw the administration of the temple became increasingly wealthy and powerful to the point that they were able to take control of the government of Thebes toward the end of the New Kingdom when rule of the country became divided between theirs at Thebes in Upper Egypt and that of the pharaoh in the city of Per-Ramesses in Lower Egypt. The rise of the power of the priests, and the resulting weakness of the position of the pharaoh, is considered the major contributing factor in the decline of the New Kingdom and the beginning of the Third Intermediate Period (1069 - 525 BCE). The temple complex was damaged in the Assyrian invasion of 666 BCE and again by the Persian invasion of 525 BCE but, both times, was repaired and renovated. By the 4th century CE Egypt was a part of the Roman Empire and Christianity was being promoted as the one true faith. The emperor Constantius II (337 - 361 CE) ordered pagan temples to be closed in 336 CE and the Temple of Amun was deserted. Coptic Christians made use of the building for church services, as evidenced by Christian art and inscriptions on the walls, but then the site was abandoned. It was rediscovered during the 7th century CE Arab Invasion of Egypt at which time it was called "Ka-ranak" which means 'fortified village' because of the enormous amount of architecture amassed in one area. When European explorers first began traveling in Egypt in the 17th century CE they were told the grand ruins at Thebes were those of Karnak and the name has been in use for the site since then. Amun (also known as Amun-Ra) was a minor Theban deity who, after Mentuhotep II unified Egypt in c. 2040 BCE, rose in prominence. The powers of two older gods, Atum and Ra (the creator god and sun god, respectively) were combined in Amun, making him the supreme king of the gods, both creator and preserver of life. The area of Karnak may have already been sacred to Amun before any structures were built there or could have been sacred to Atum or Osiris, both of whom were also worshipped at Thebes. The site was already set apart as holy ground in that no evidence of domestic homes or of markets has been found there, only religiously-themed buildings or royal apartments constructed long after the first temple was constructed. As there was no separation of one's religious beliefs from one's daily life in ancient Egypt one might think that it would be hard to tell a purely secular building from a religious site but this is not so, or not always so. At Karnak the inscriptions left on the columns and walls, as well as the artwork, clearly identify the site as religious in nature from the earliest times. The first monument thought to be raised at the site is that of Wahankh Intef II (c. 2112 - 2063 BCE) who erected a column to the honor of Amun-Ra. This claim has been contested by those scholars who point to the king's list of Thutmose III in his Festival Hall who claim the site was first developed for religious purposes in the Old Kingdom. They also sometimes point out Old Kingdom styles in some of the architecture of the ruins. The architectural link has no bearing on the claim, however, because the style of the Old Kingdom (the age of the great pyramid builders) was often emulated by later ages to invoke the grandeur of the past. If any Old Kingdom rulers built there then their monuments were removed by later kings and this is what some scholars claim Thutmose III's king list points to. Wahankh Intef II was one of the Theban rulers who waged war against the ineffectual central government at Herakleopolis and paved the way for Mentuhotep II (c. 2061-2010 BCE) to overthrow the kings of the north and reunite Egypt under Theban rule. When Mentuhotep II came to power he built his mortuary complex directly across the river from Karnak at Deir el-Bahri and this has suggested to some scholars that a significant temple to Amun already existed there at this time; not just the monument of Wahankh Intef II. Mentuhotep II may have built a temple at the site to honor Amun for helping him achieve victory, and then built his complex across from it, but this claim is speculative and no evidence suggests it. Most likely he chose the site of his mortuary complex because of its proximity to the holy site across the river; there would not have had to be a temple on the spot at the time to motivate him. The first known builder at Karnak is the king Senusret I (c. 1971-1926 BCE) of the Middle Kingdom who built a temple to Amun with a courtyard which may have been intended to honor, and mirror, Mentuhotep II's mortuary complex across the river. Senusret I, then, would have been the original architect of Karnak in response to the great hero Mentuhotep II's tomb. Any claims along these lines remain speculative, however, and all that is clearly known is that the area was considered sacred before any temple was constructed there. The Middle Kingdom rulers who followed Senusret I all added their own touches to the temple and expanded on the site but the rulers of the New Kingdom would transform the modest temple grounds and buildings into a colossal complex of immense scope and detail. Nothing like Karnak had been attempted since the 4th Dynasty king Khufu (c. 2589-2566 BCE) built his Great Pyramid at Giza. The importance of Karnak resided in its being the contact point between Amun, the supreme ruler of the universe, and the pharaoh, the supreme ruler on Earth who represented all Egyptian people. Thus, especially from the New Kingdom onwards, every king who wished to be remembered forever was virtually compelled to contribute to the splendor of this most important temple (41). Karnak remains the most remarkable religious complex ever built on earth. Its 250 acres of temples and chapels, obelisks, columns and statues built over 2,000 years incorporate the finest aspects of Egyptian art and architecture into a great historical monument of stone. It was designed in three sections. The first one extended from the northwest to the southwest, with the second part at right angles to the original shrine. The third section was added by later kings. The plan of the Temple of Amun, evident even in its ruined state, contained a series of well-coordinated structures and architectural innovations, all designed to maximize the strength of the stone and the monumental aspects of the complex. Karnak, as with all other major temples of Egypt, was graced with a ramp and a canal leading to the Nile and this shrine also boasted rows of ram-headed sphinxes at its entrance. 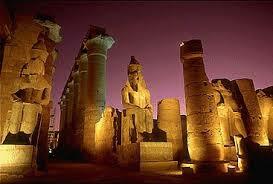 At one time the sphinxes joined Karnak and another temple of the god at Luxor, to the south (133). This huge complex, dedicated to Amun and a number of honorary gods and goddesses, had at its center the inner sanctum of the god's home which was perfectly aligned with sunset at the summer solstice. All of Karnak, in fact, is aligned with celestial events which would have been interpreted by the priests there to understand the will of the god and his wishes for humanity. Karnak is comprised of a series of pylons (monumental gateways which taper towards the top to cornices), leading into courtyards, halls, and temples. The first pylon opens onto a wide court which invites the visitor further. The second pylon opens onto the Hypostyle Court which measures 337 feet (103 meters) by 170 feet (52 meters). The hall is supported by 134 columns 72 feet (22 meters) tall and 11 feet (3.5 meters) around in diameter. The god to whom the ground was originally dedicated may have been Montu, a Theban war god, and there was a precinct dedicated to him even after the rise of the cult of Amun. As the temple grew, however, it became divided into the three sections Bunson mentions above and dedicated to Amun, his consort Mut who symbolized the life-giving rays of the sun, and their son Khonsu, the moon god. These three gods became known as the Theban Triad and would be the most popular gods until the cult of Osiris with its triad of Osiris, Isis, and Horus overtook it (eventually becoming the Cult of Isis, the most popular in Egyptian history). The temple complex grew from the original temple to Amun of the Middle Kingdom to an honorary site for many gods including Osiris, Ptah, Horus, Hathor, Isis and any other deity of note to whom the pharaohs of the New Kingdom felt they owed a debt of gratitude. The priests of the gods administered the site, collected tithes and gifts, dispensed food and counsel, and interpreted the gods' will for the people. There were over 80,000 priests employed at Karnak by the end of the New Kingdom and the high priests there were more wealthy than the pharaoh. The cult of Amun caused problems for the monarchs of the New Kingdom from the reign of Amenhotep III onwards, probably earlier. Except for the half-hearted attempts of Amenhotep III and the dramatic reformation of Akhenaten, however, no ruler ever tried to do anything to significantly curb the priest's power and, as noted, every king contributed to Amun's temple and the wealth of the Theban priests without pause. Even during the disunity of the Third Intermediate Period (c. 1069 - 525 BCE), Karnak still commanded respect and the rulers of Egypt continued to add to it what they could. Toward the end of the Third Intermediate Period Egypt was invaded first by the Assyrians in 671 BCE under Esarhaddon and then in 666 BCE by Ashurbanipal and Thebes was destroyed, but not the Temple of Amun at Karnak. This same paradigm repeated itself in 525 BCE when the Persians invaded the country. The Assyrians, in fact, were so impressed by Thebes and its great temple they ordered the Egyptians to rebuild the city after they had destroyed it. The Persians were driven from Egypt by the pharaoh Amyrtaeus (404 - 398 BCE) and Egyptian rule resumed; as did construction at Karnak. The pharaoh Nectanebo I (380 - 362 BCE) added an obelisk and a pylon (unfinished) to the temple and built a wall around the site, perhaps to protect it from any future invasions. Nectanebo I was one of the great monument builders of ancient Egypt who was also responsible for the Temple of Isis at Philae. He was one of the last native Egyptian kings of the country. When the Persians returned in 343 BCE Egypt lost its autonomy. In 331 BCE Alexander the Great took Egypt from the Persians and, after his death, his general Ptolemy claimed the country as his share of Alexander's empire. Ptolemy I (323 - 283 BCE) tried to blend Egyptian and Greek culture to create a harmonious, multi-national state but focused most of his attention on Alexandria. His later successor Ptolemy IV (221 - 204 BCE), however, turned his attention to Karnak and built a hypogeum there, an underground burial chamber, dedicated to the god Osiris. The Ptolemaic Dynasty began to unravel under his reign and no other rulers of this period made additions to the Karnak site. The dynasty ended with the death of Cleopatra VII (69 - 30 BCE) after which Egypt was taken by Rome. The Romans also focused their attention on Alexandria and ignored Thebes and its temple. They sacked Thebes in the 1st century CE during or after a battle with the Nubians to the south and left the city in ruins. After this date, fewer and fewer people visited either the city or the temple. In the 4th century CE, Christianity was adopted by the Roman Empire under Constantine the Great (306 - 337 CE) and the new faith, no longer persecuted, began to gain more power and wider acceptance. The emperor Constantius II (337 - 361 CE) closed all pagan temples in the empire which of course included Karnak but, by this time, Thebes was a ghost town with some few inhabitants living in the ruins. The Coptic Christians of the area used the Temple of Amun as a church in the 4th century CE but then abandoned it. The city and the temple complex were then left to decay. In the 7th century CE the Arabs invaded Egypt and were the first to call the great structure "Karnak" because they believed it to be a fortified village ("el-Ka-ranak"). This was the name the local inhabitants gave to the early European explorers of the 17th century CE and the name the site has been known by since. Today Karnak is a great open air museum drawing thousands of visitors from around the world. It is one of the most popular tourist attractions in Egypt and among the most impressive ruins in the world. As with ancient sites like Baalbek, Stonehenge, the Great Pyramid, Nemrut Dag, Angkor Wat, and others, Karnak continues to fascinate visitors by its size, scope, and the possibilities of how the temple was built in a time without cranes, without trucks, without any of the modern technology which one considers so essential in the modern day. The history of Egypt from the Middle Kingdom through the 4th century CE is told on the walls and columns of Karnak and, as people today visit the site and see the inscriptions, they fulfill the hope of the monarchs of ancient Egypt that they would live forever through their great deeds recorded through their contributions to the Temple of Amun at Thebes. How Did King Tut Really Go? Did ancient Egyptian scribes worship BABOONS? How were egyptians built the pyramids? Beauty queen Nefertiti. Myth or Reality?